Once upon a time, long, long ago, ladies wore gloves and carried handkerchiefs as part of their apparel for activities like church, shopping or lunch with other ladies. It was a more genteel era, an age of structured dresses, pillbox hats and cultured civility. I often wonder if I wasn’t born in the wrong time because I sometimes yearn for the days of gloves, hats and hankies. As a lifelong collector with a large extended family, I have inherited some of my Granny’s, Mama’s and aunts’ gloves and hankies. The detail and craftsmanship put into these tiny items is impressive. 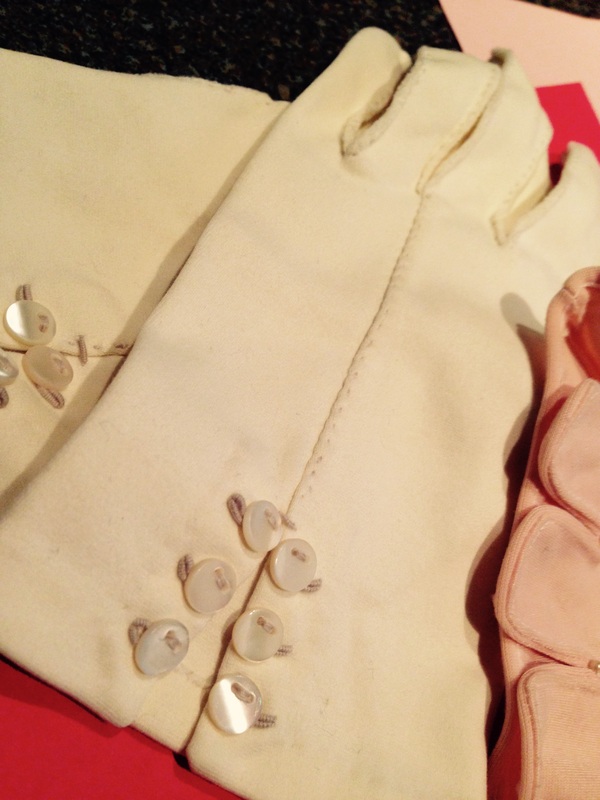 Many of the gloves have decorative stitching or embroidery, and little bitty pearl buttons sewn onto the cuffs. 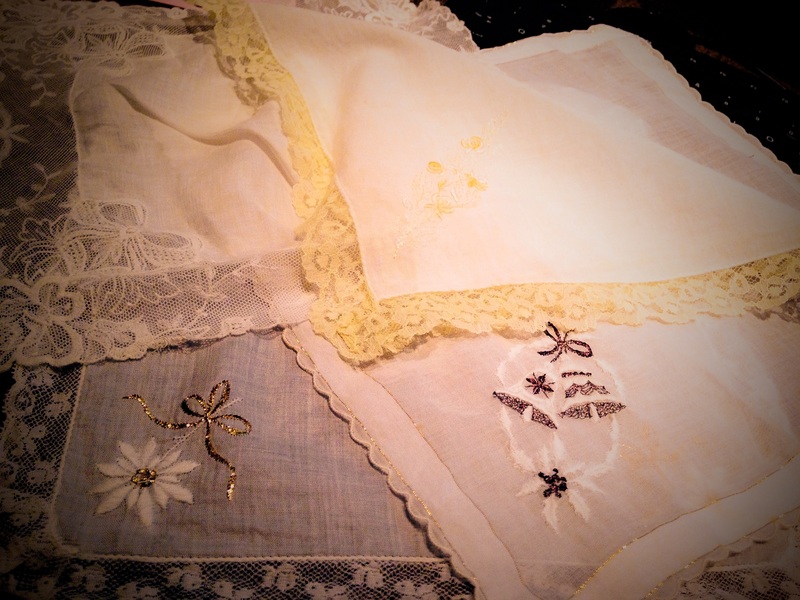 Most of the handkerchiefs boast intricate stitching and lace as well. From the research I’ve done and the variety of items I’ve inherited, there seem to have been specific occasions when a particular length of glove might have been worn, or when a certain hankie might have been carried. Some of Granny’s handkerchiefs are decorated with motifs for Christmas, weddings or Valentine’s Day, while the gloves range from just-wrist-length to halfway up my arm. Generally, the longer the glove, the dressier the occasion. There used to be strict etiquette guidlines for such matters and those rules can still be found in old books and online. It’s fun to look back at how fashion and manners used to be. There are also treasure troves of items like these in antique shops, flea markets and on the Internet. 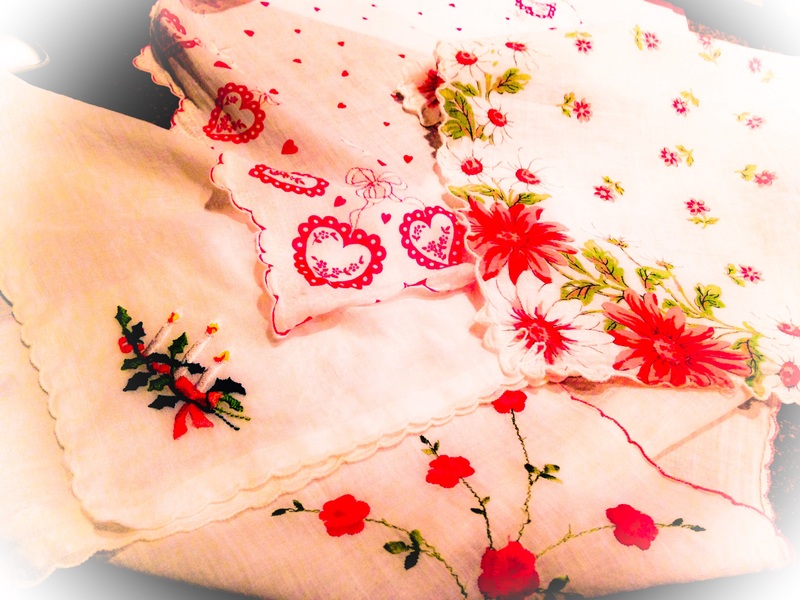 Vintage textiles fascinate me, and the gloves and handkerchiefs in particular, items that began as strictly utilitarian objects, started being decorated and embellished. They became both useful AND beautiful, petite pieces of art, suitable for framing, shadow boxes and any other display method one can imagine. I can only begin to imagine the stories behind these tiny treasures. I guess that’s why the gloves and hankies from my family mean so much to me. The stories that come with them are part of my heritage. 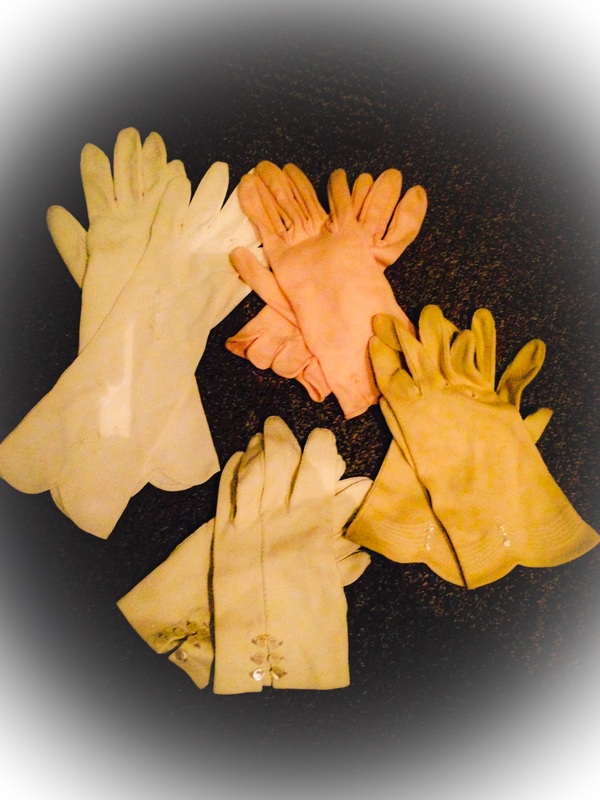 There were the gloves that I wore with my wedding gown that belonged to Mama, and to Granny before her. Even though Granny had been gone for 13 years by the time my wedding day came, wearing her gloves made me feel like part of her was with me somehow. Granny also kept her diamond wedding set tied into the corner of a little hankie when she wasn’t wearing them (which was most of the time because they were fancy and she didn’t want to lose them). I wish I knew which hankie she used for that. 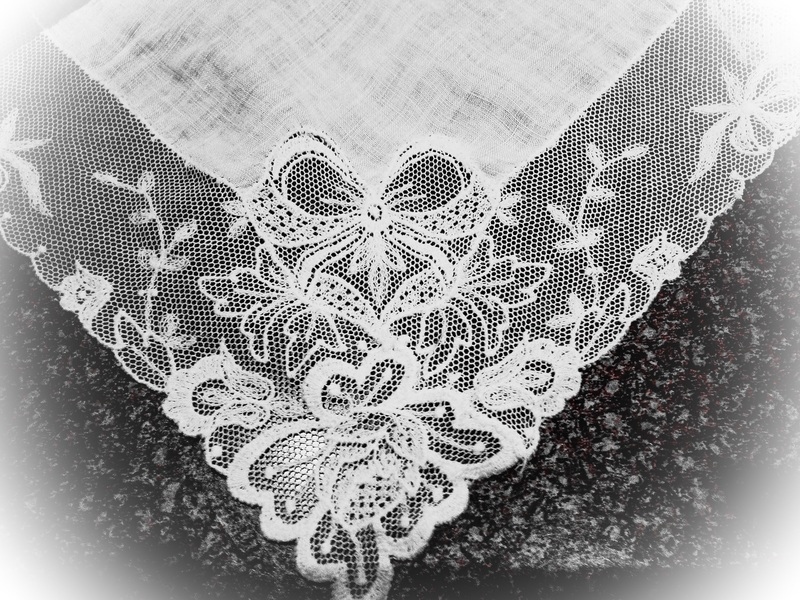 Before Jeff and I were married, his Aunt Ann made me a beautiful lace-decorated basket and pillow, and wiith it she gave me a handkerchief that had belonged to her mother, Jeff’s grandmother. What a sweet and meaningful welcome into the family. I carried it on our wedding day. I can imagine the church revivals, weddings and funerals where those gloves were worn…the tears of grief and joy wiped from the cheeks of loved ones with those soft squares of embroidered linen and lace. Ages later, I look at these mementoes and I feel the women of my family in the things that they once Touched.